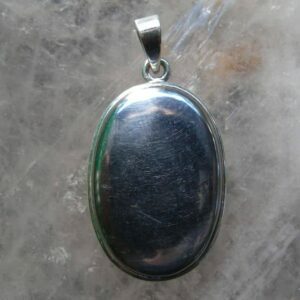 Meteorites represents the energy of another time and place, and has been regarded as Sacred by many ancient cultures. Used to balance and align the physical and emotional bodies, and to enhance communication with aspects of the self hich are often concealed. Gibeon Meteorite is a large meteorite that burst high in the atmosphere, and was first reported in 1836. The chemical composition of the Gibeon is: 90% iron, 8% nickel, 0.4% cobalt, 0.04% phosphorus. Troilite (an iron sulfide) is common as nodules and in recrystallized forms. Daubreelite is found in the kamacite. Enstatite (a silicate mineral–pyroxene) is rare. Tridymite (a silicate mineral) is rare.